"Pyaar ek sim card ki tarah hota hain. Mehanga ya sasta mobile kahan dekhta hain." This dialogue should pretty much set the tone for everything that one can expect from film maker Abhiraj Minawala's Loveyatri. Right from the opening scene, the makers make it clear - expect colours, music, mushy moments of 'love at first sight' and yes, Garba! Lots of it. 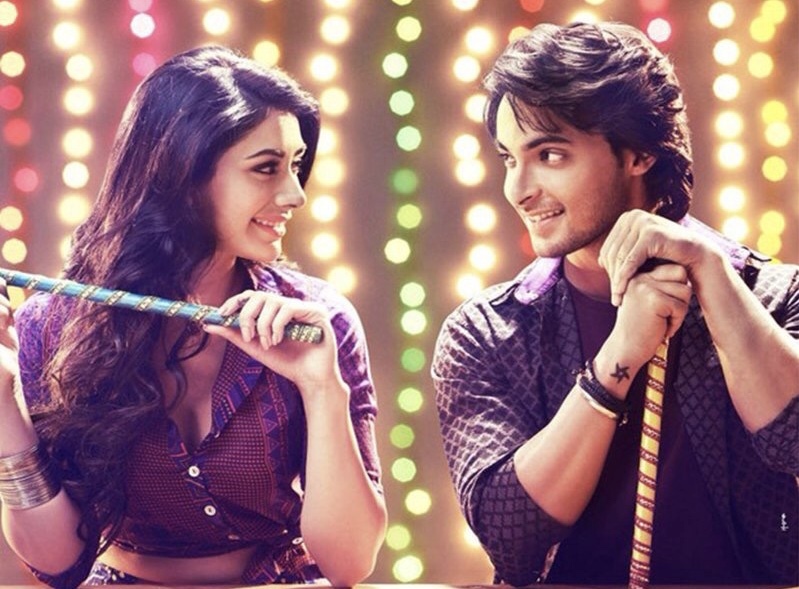 The film marks Aayush Sharma and Warina Hussain's debut, while Minawala makes his feature film debut as a director. But, does it live up to all the expectations? Read on to find out! The premises is pretty straight forward, and the trailer should give you enough insight. 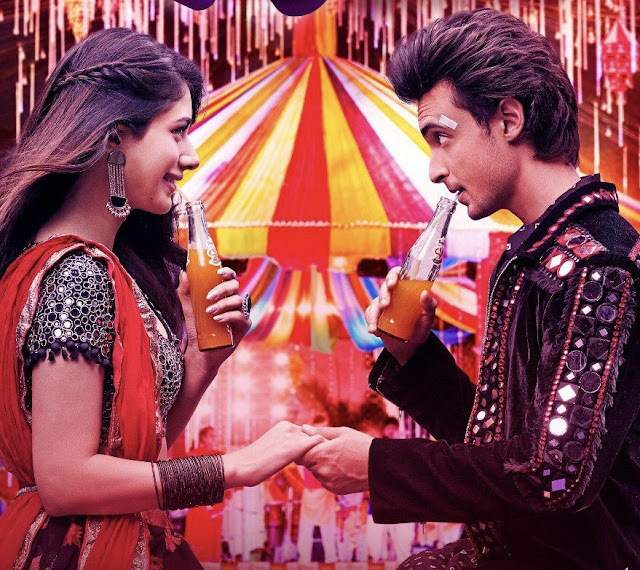 Sushrut's (Aayush Sharma) only aim in life is to have a Garba academy of his own. Susu (that nickname, though) is well known for his Garba skills, with kids and teens thronging his place for lessons everyday. Obviously, his parents aren't too happy with the boy's vision. But, he finds support in his 'Mama' (Ram Kapoor) - a 'Gujarati' saree shop owner, who doubles as a Garba singer. Very soon, it's that time of the year, when festive fervour in Gujarat is at it's best - Navratri, and the boys set out to find the 'love' of their life. Enter Michelle (Warina Hussain), 'jisse dekhti hi Sushrat ke sar pe barsaat girne lagti hai'. Of course, our hero has fallen head over heels in love (quite a romantic moment indeed), and thus begins their journey of love. So, our heroine is a scholar, who scores well and gets through B-school, with an entire career plan chalked out. However, an important point to note is that the girl is based in London, and her father is quite the ambitious businessman, who hasn't even spared his daughter's name in the name of 'westernisation' (he turns Manisha to Michelle). Will our 'Love Yatris' survive this journey, especially with her father playing a spoilsport? Can Sushrut and Michelle ultimately unite to do the 'Chogada' on the streets of a foreign land? You will have to watch the film to find out. The story felt a bit weak and teeny bit predictable at most times. It almost got to a point where one could make out what follows next. The screenplay was too haphazard. Well, the dialogues were quite interesting. Don't know if they can qualify as 'massy' or 'entertaining', but personally, I thought they were laced with a decent touch of humour and emotions. In fact, if you are a Bollywood buff like me, chances are that some of them might make you smile or even laugh. Yes, that's the level of filmy-ness! Imagine a serious situation at a club, where the Mama has a chat with Sushrat about his troubled love life. That's when 'Mama' actually goes, "Hum logon ne pyaar bhi karna filmon se sikha hain." Well said, Mamaji! Very well indeed (not). Do not attempt these lines for real [unless the aim is to be forever alone]. Chances are that you may never end up finding love. Ever. Well shot Garba sequences and romantic moments keep you entertained during the first half. Although the film is well under 2 hours, the second half feels a tad bit stretched. So yes, the pre-interval part has an edge. Loveyatri's biggest highlight is the wonderful music, which has the perfect variety and range. From the foot tapping Dholida to soulful Tera Hua and upbeat Akh Lad Jave; the soundtrack is simply brilliant. In fact, it won't be wrong to say that music is an integral hero of Loveyatri. Sanchit Balhara's BG score is decent. Ditto the cinematography by Jishnu Bhattacharjee, that brings up some vibrant sequences that capture the essence of Navratri in Gujarat very well. With the festival up in a few days, it will actually force you to book a trip to Ahmedabad right away. Another special mention would be the costumes - designed by Manish Malhotra, Alvira Agnihotri and Ashley Rebello. While the duo dance the night away, it would be hard to miss the intricate designs and detailing that has gone into the making of those gorgeous outfits. Kudos to the costume department for a fine job! As far as performances are concerned, the ensemble cast is decent. Ronit Roy (Michelle's father) is impressive, but gets very little screen time. Sushrat's friends - called Rocket and Negative (Pratik Gandhi) - perform well as the humorous duo, who stand by their friend (and even back out, knowing he might fail). Ram Kapoor as the 'Love Guru' Mamaji is decent, and gets some of the most 'filmy' dialogues that have been highlighted in the film. Loveyatri marks Aayush Sharma's much hyped debut. The actor does have a decent screen presence, and dances quite well. He aces the Garba choreography quite well, and his footwork, body movements were totally on point. However, one does feel that he has a lot to learn, especially during the emotional sequences. Warina looks beautiful, especially during the Garba sequences in Gujarat. Even her efforts at performing the choreography is decent. But, it's hard to connect with her expressions and performance. There are some really beautiful moments that strike out, especially during the first half. However, being a romantic film, their chemistry could have been a lot more stronger! At it's core, the film becomes a victim of a really weak screenplay and story. But, that's not to take away from the elements that genuinely strike out. The music keeps you going and will even go to the extent of making you dance while watching the film (I even did a step or two while being seated. Such skills, I tell you). The film will make you fall in love with the vibrancy of festivals in India and further, push you to visit Gujarat at least once during Navratri. However, I really wish the lead pair's romantic journey could have established a stronger connect. Nevertheless, Loveyatri is an average attempt, especially with some decent technical aspects and a well paced first half. Oh, and my takeaway from the film? I've got two! One - don't eat ketchup with pizza. You might just end up losing the one you love, and Two - Pyaar ek sim card ki tarah hota hai. Chalo, Barabar Samajya Tame? Verdict: Watch it for the vibrant sequences and costumes, brilliant soundtrack, and perhaps, dialogues that scream - Oh, so filmy!